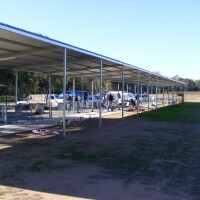 Work has been completed on the replacement of the old shade cloth on the flight line with a significant tin roof area. A huge amount of work has been put in by those at the club working bee. Many thanks to sponsers and the Moira Shire Council and to Club members for making this magnificent all weather structure happen.